Six months ago, at SXSW 2018 in Austin, a team from Bose gave early demonstrations of a new platform technology. Previewing special devices to enjoy music and control an augmented sound experience, Bose AR made an incredible first impression. Equipping attendees with devices to try out, the team listened and took user feedback and excitement back to Bose offices. Since then, the platform has advanced with a vision for what developers, partners and users can do with spatial sound and motion control. Last week I joined many members of Bose AR and supporting teams at TechCrunch Disrupt 2018 in San Francisco. This was my first event representing Bose as Developer Relations Lead. Participating in the 3-day event presented an opportunity for our team to re-engage attendees, demonstrate our progress with the platform and begin welcoming developers to get early access to our SDK and devices. This was the first TechCrunch Disrupt for Bose, an event that acts as a showcase of companies revealing new technology to ‘disrupt’ or enable new innovation in the industry. It also presents startups, entrepreneurs and developers a chance to network, meet investors and find new technologies and partners to work with. We began engaging attendees at a first day presentation. Vivek Agrawal, on behalf of the Bose AR team, shared an overview and update on the platform and the available Wearable SDK. This included some detail on Bose AR-enabled products, reaching millions by early 2019, that will feature Bose AR going forward. Vivek spoke to some likely examples where Bose AR would bring to life new experiences in fitness, travel and gaming. Steve Romine, from the Bose Ventures program, followed with detail outlining how Bose identifies investment opportunities and has dedicated $50 million dollars to invest in the AR space. Our developer relations team is working with ventures to bring AR to startups around the country. Corey Hoard, engineer at Zapdot, previewed a Bose AR-enabled game, built with the Wearable SDK and 3D gaming platform Unity. Throughout the presentations and Corey’s demo, I noticed many in the packed workshop room leaning in. There was clear interest and excitement as capabilities were revealed. The Unity plugin represents one of many libraries we’ll offer to extend capabilities of the SDK. Downstairs on the expo floor, our incredible team engaged attendees. 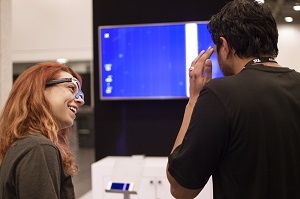 Featuring 8 demo stations and a sound-proofed demo room, variations of upcoming Bose AR-enabled devices were offered as hands-on experiences. In the coming weeks, our team will begin distributing the SDK and proudly sending our first batch of Bose-AR enabled devices to developers via an early access program. 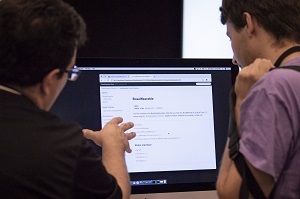 Based on the ideas we heard at the event and those coming through on our developer portal, we are excited to begin supporting developers to build the first wave of experiences, together, for our users. Many of these new experiences will likely launch with our products, giving members of our community some amazing opportunities to be right there with us as we introduce Bose AR to consumers. Those that have filled out the form and joined our developer community have also expressed great interest in attending hands-on workshops. Starting with Austin, TX next month and working our way around the country, we look forward to bringing Bose AR best practices, new code samples and tutorials to developers. Stay tuned on our developer portal as we announce schedules for workshops, webinars and other events where we’ll bring Bose AR to you. Be sure and learn more about Bose AR, how you can get early access to our SDK, and stay updated as we get closer to making all of this generally available to our community.